Outside the South door of St Swithun’s church, behind the path that leads to the lych gate, there are 3 tablets which form a memorial to 3 Protestants, burnt at the stake on 18th July, 1556, in East Grinstead. The inscription is very faded now, but it reads: ‘Beneath these stones are interred (as it is believed) the ashes of Thomas Dunngate, Anne Tree, and John Forman, who were burned to death in High Street East Grinstead, for adherance to the reformed faith: fideles usque ad mortem: faithful even unto death’. Burning at the stake must have been a truly horrible death. This event took place on a Saturday, which was market day, presumably for the maximum impact upon the townsfolk. The burnings were a small part of the ‘turn or burn’ policy of Queen Mary Tudor. She came to the throne of England upon the death of her Protestant half-brother, Edward VI, in 1553. At first, Queen Mary was welcomed by her people as the rightful heir, according to the will of her father, King Henry VIII. The 9 days Queen, Lady Jane Grey, was ousted, and eventually executed. Queen Mary set about having the Latin Mass restored, disallowing married priests, and persecuting Protestants. She believed that Protestants must turn from their heretical ways, or face the flames of hell. Her reign saw more earthly burnings of ‘heretics’ than any of the other Tudors- an estimated 284, including 56 women, in less than 5 years, compared to 81 in her father’s 38 year reign, and 10 in her grandfather Henry VII’s reign. Another 30 probably died whilst in prison for their beliefs. Queen Mary married King Philip of Spain, her cousin, who was 11 years younger than her. Twice, she thought herself with child, but there were no babies. If she had born children, or lived longer, her religious policies might have endured, and she could have completed the restoration of the Roman Catholic faith to England. Queen Mary died in 1558, and was succeeded by her Protestant half-sister, Elizabeth, who then reigned for 45 years. Queen Mary’s policies meant that the Vicar of East Grinstead, Richard Best, appointed in 1553, was deprived of his living on 9 April 1554, because he was married. He apparently regained the living: the board says in 1556, but Queen Mary died in 1558. Of the 3 people burned, little is known. They may not have been residents of East Grinstead. The town may have been only their place of execution. 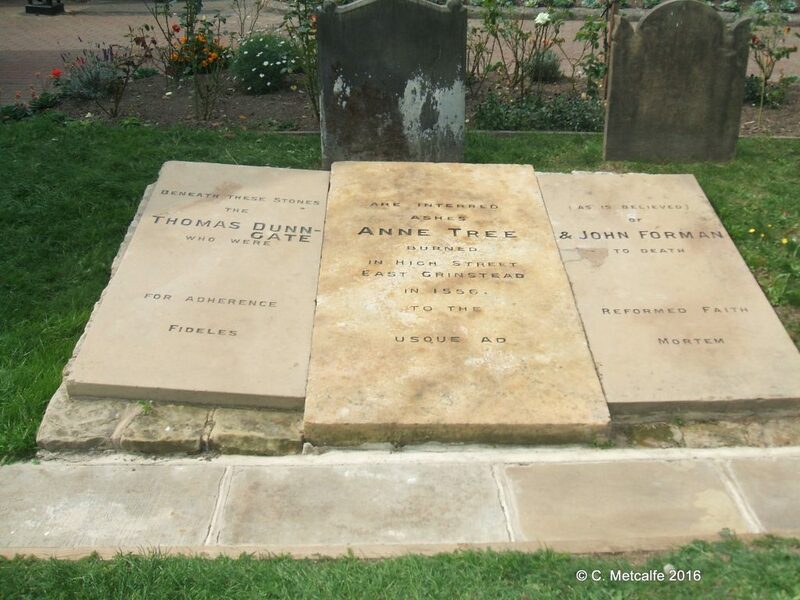 There is a tradition that Anne Tree was from West Hoathly, and a small brass was put up in the church there in her memory in 1940. She was described as ‘Mother Tree’ in Foxe’s Book of Martyrs in 1563, which might suggest that she was elderly. 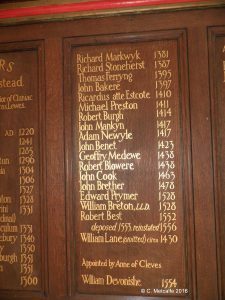 She may have been connected with Thomas Athothe or Hoath, a priest who was not the Vicar of East Grinstead, but who was condemned for heresy and probably martyred in the diocese of Chichester. Another 9 people were burned at the town of Lewes. What happened to the ashes of the 3 burned in East Grinstead is not known. Such ashes would not normally be buried in consecrated ground. In the late 1800s or early 1900s, it is believed that Lady Musgrave had the stones inscribed and laid over ashes then believed to be those of the martyrs. After nearly 500 years, it is unlikely that there are ashes beneath the memorial now. The important thing is that these 3 were loyal to their faith and even prepared to die for it. A misunderstanding has crept in and some people think that this monument is about the burning of witches- it is not. It is about the dreadful death of 3 people brave enough to die for their beliefs. Sometimes, flowers are placed on these stones, showing respect for John Forman, Thomas Dunngate and Anne Tree, wherever they came from.